March 5th and 6th- Free Admission to Nutropolitan Museum of Art! The exhibit is free admission and open to the public on Friday, March 4 and Saturday March 5 from 10 AM to 6 PM, and Sunday March 6 from 10 AM to 4 PM. 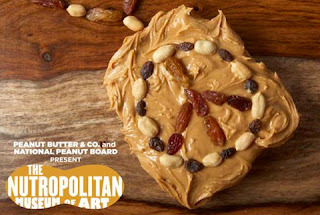 By visiting the gallery you will receive a free jar of peanut butter and a second jar will be donated to the Food Bank for New York City in your honor. And you can even meet a peanut farmer and get a kit to grown your own peanut plants!